Yesterday evening Suria KLCC kicked off its 2013 Spring Summer Fashion Week in style with a sneak preview of 17 popular brands showcasing their latest Spring Summer 2013 collection. Bernie Chan emcee of the night looking stunning in Fuchsia Ted Baker. We were entertained by songstress Ida Mariana with her powerful voice and violinist Joanne Yeoh with her electrifying performance. Shoppers can catch the runway at Suria KLCC Centre Court from 18th till 21st April as per the time schedule showed here. There are 17 brands such as Samsonite, G2000, Steve Madden, Focus Point, Nine West, Jelly Bunny, Harley Davidson, Timberland, Mothercare & Gingersnaps, Braun Buffel, Ted Baker, Tiamo, Poney, Havaianas, Nose and The Travel Store. 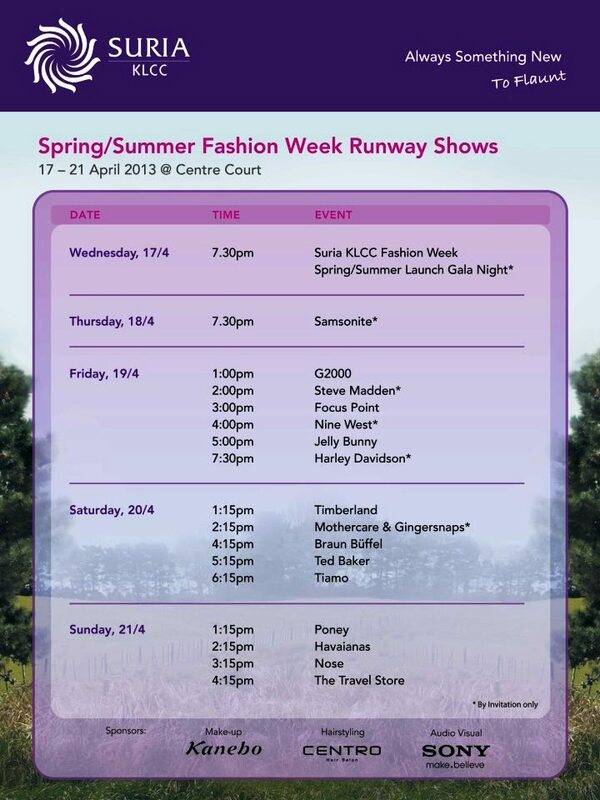 2013 Spring Summer Fashion Week featuring runway shows by participating brands at selected times and special promotions from now until 12th May. Besides the runway shows, there are many promotions going on. Shoppers who spends RM500 and above in a maximum of two accumulated receipts can redeem a beautiful straw bag while the first 20 lucky shoppers who spend RM1,500 every weekend (Saturday & Sunday only) will get a chance to get hair products from Loreal Professionals.